LOCATION: This home is a 5 minute walk and a 1 minute bike ride to the beach. DETAILS: 215 Salt Box Lane is a shingle-style 3 bedroom, plus loft, 4 bath beach-home in WaterSound. It is under new ownership, is filled with new upgrades, has garage access upon request, and there is abundant spaces parking in the rear. Upon entering, you will be awe-inspired by the warm tones and comfortable furnishings of the spacious great room. The relaxing living room, well-appointed dining room and incredible kitchen are all included in this open floor plan which is perfect for everyone to enjoy after a fun-filled day at the beach. You will also be able to enjoy meals from the home's fabulous kitchen with its high end appliances, granite counter tops, stunning cabinetry and the fantastic breakfast bar. Rounding out the first floor is the tranquil master bedroom that comes complete with a king bed and spa-like bathroom with a single vanity and walk-in shower. Connected to master bathroom is an additional full bathroom with shower/tub combo. On the second floor, you will find the comfortable and relaxing 2nd master bedroom with a king size bed that has a connecting bathroom with a single vanity and walk-in shower. There is also a bedroom with a bunk bed on this floor that has a connecting bathroom with a single vanity and tub and shower combination. An amazing loft with a queen bed, a twin bed and a sitting area can be found on the second floor. In total, there are 3 smart tvs, 5 HD flat screens as well as Sonos Audio. This house has ample indoor and outdoor space with an awesome screened porch which provides for a great gathering spot for everyone to spend time together. This sensational home is simply stunning and it is located only two blocks from the WaterSound Beach Club. This sensational WaterSound home is simply stunning and gives you the serenity you have been craving and it is all here at one of the most beautiful beaches in the world! AMENITIES INCLUDE: Community Pool, bunk beds. Parking can be found throughout the community. Complete Clean Linen Participant - ALL linens, including comforters laundered upon every checkout. Great house with lots of room for sleeping & spreading out. We had an issue with the HVAC leaking, & I suspect it is on its last leg, as we could never get the temperature comfortable on both levels at the same time. But love Watersound, and appreciate that 360 sent maintenance quickly to deal with leaking HVAC. Also, Beach Club is amazing! Thank you for your review, we appreciate the feedback. The homeowner is meticulous insits on the AC being perfect. He has already addressed this issue to ensure everyone stays comfortable. We hope to see you back at the beach soon! Marist Ladies Beach Retreat: November 2018. This was our first visit to 215 Salt Box Lane and definitely not our last. From the moment we arrived, we knew we had picked the perfect place for our annual “girls getaway”. This spacious, beautifully decorated home easily accommodated our large group of 11 but always felt like a cozy beach cottage. It was Walt Disney who said, “There is no magic in magic. 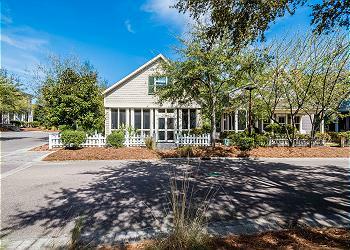 It’s all in the details.” This home, beach and the 30A community provided all the details. Looking forward to our return trip next year! We could not be more delighted to hear how much you enjoyed your vacation with us in Watersound! We agree that this home is perfect for a girl trip and offers amazing accommodations for all! We love the photo you shared, we can tell you all had such a wonderful time! Thank you for staying with 360 Blue, we hope to see you again! The home was absolutely wonderful and comfortable. It really felt like a home away from home. We couldn’t have asked for anything better. It is great that the kitchen comes equipped with dishes so you can feel free to cook in the house and the dishes were in good condition (normally on rentals we’ve seen really beat up and used dishes). We did come up with a couple of issues when we arrived though; The golf cart did not have a charger and there was no key for it. The land phones did not work... there is hardly any cell reception so naturally we got frustrated that we couldn’t even call to ask for help. The other issue was with the bikes, two of them were low on air and it took like three days to get someone to come put some air in them. Other than that, it was a very wonderful experience and we had an amazing family vacation here. Thank you for helping us make it possible! We discovered crab island on this trip. Rent a boat and spend the day there and you’re guaranteed a day filled with fun!! We are so glad that you had such a wonderful time with us for your vacation in Watersound! We agree that this home is perfect for a fun-filled relaxing vacation and the photo you shared is priceless! We apologize for the frustration felt during your stay and I will be sharing this with our team in an effort to correct this for future guests. We look forward to seeing you all again very soon! We had a fabulous stay in this beautiful home! House can comfortably sleep 10 and a golf cart for easy access to the beach and to load chairs/coolers etc. Watersound is such a great family vacation spot! We will definitely be back next year! We are beyond thrilled that you enjoyed your vacation! We agree that the Watersound area is a wonderful community and the accommodations of this home are second to none. The photo you shared is absolutely breathtaking! We hope to see you again very soon! Week could not have been better including weather! We are so thrilled you had a perfect week!! We hope to see you again soon! We had an amazing time! The house is absolutely gorgeous with plenty of room for our family. Watersound is now one of my favorite places in Florida! We will definitely be back! We are so thrilled that you enjoyed your family vacation in Watersound and found a new favorite destination! The picture you shared is precious! We agree this home is the perfect spot for families. We look forward to seeing you in Watersound again soon! Incredible Easter Family Vacation! The house was perfect, clean, inviting, 4 full baths with a great location with extra parking! Loved the Beach Club, Family Tennis, private WS Beaches and Dune Sider Pool that did not get crowded, not to mention the golf cart. The Hub is a must! Hope to do it again next year , if not sooner! Thank you for choosing 360 Blue for your holiday getaway! We are thrilled that you enjoyed your time in this amazing home. We look forward to having you back soon! Wonderful stay! Gorgeous, clean home that sleeps 8 easily with 4 full baths. Plenty of parking and close to beach club. New golf cart as well! We’ll be back! What a beautiful view! We are so happy you enjoyed your stay in this amazing home. We loved having you with us and hope to see you back soon!